It’s been a completely crazy October for Tin Man Games, which has certainly kept us on our toes. 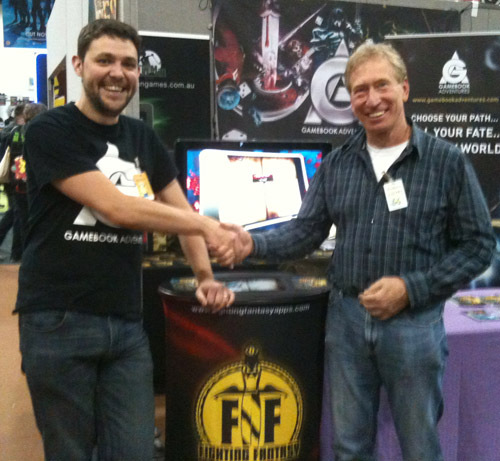 Not only have we had potentially our biggest app release yet (more on that in a mo’), but we’ve been securing some new licenses, had two of our old gamebooks released on PC/Mac, attended a games conference and exhibited at a comic-con – the last two being on either sides of the planet! You could forgive us for feeling a bit weary, but as you’ll see in our “upcoming” section, there’s no time for slow down! Dream Team time, Tin Man Games and the accept no substitute, Fighting Fantasy folks. Beautifully implemented. Here’s hoping they’ll work through the FF classics with the level of attention to detail on display here. On the other side of the planet and up a bit, Neil attended the MCM Expo London Comic-Con in the UK for 3 days, gathering together all the banners and other stuff that we usually show off at PAX in the States. 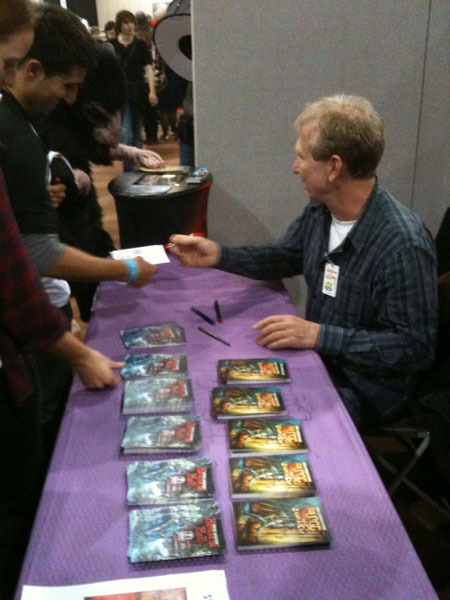 It was a successful few days with the highlight being the appearance of Fighting Fantasy co-creator, Steve Jackson, who graciously signed postcards, books and chatted with FF fans for a couple of hours on Saturday afternoon! Jonathan Green (author of Temple of the Spider God and many FF books himself) also came along on Sunday to lend his support and catch-up with Neil. Jon is writing a new Gamebook Adventures series for us – more on that in the coming months! We must give a big shout out to Robert Swan of Aah Games who generously shared a booth with us (which kept costs down) and organised everything for it, including a huge TV and speaker system so we could show off our awesome new Blood of the Zombies trailer. Rob is currently developing a Minecraft styled multiplayer FPS which certainly drew the crowds over the weekend! Thanks too to the very talented artist, Nina-Serena, who helped Neil and Rob out on Friday and Saturday manning the booth. Check out her work here. Also a thanks to Hoi who helped out Sunday too (she bought Neil some great noodles). As mentioned last month, we are working furiously on our sequel to An Assassin in Orlandes (still untitled!!) as well as bringing Steve Jackson’s Fighting Fantasy classic, House of Hell to life! Expect to see both of those sometime before Christmas. Hex Boyfriends, our second Strange Loves title is also currently being edited and could make an appearance soon. Hot on the heels of all of those is Gary Chalk’s Gun Dogs. We’ve had the first draft delivered by Greywood Publishing and Gary himself is putting the last touches to his amazing artwork. Expect to see that some time early next year all being well – we’ll have more news next month! Finally (and we’ve kept this quiet), we’re releasing a French only gamebook from Studio09 titled Sons of Urizimé, which is a Lovecraftian/Cthulu inspired tale written by our French translation team. We’ll be releasing that only in French territories to begin with, but expect an English translation appearing later next year! If you love H.P. Lovecraft, you’re going to love this. We’ve just signed the contract for yet another 80s based gamebook series that has a bit of a cult following. We’ll probably be formally announcing this in the next couple of months, but for 30+ year old gamebook geeks this is one series that should certainly raise a few eyebrows and we can’t wait to get going on it! We’ve also nearly signed another contract for a single gamebook that has already been a smash-hit in other another gamebook form recently. Again, too early to divulge at this stage, but will be another one that will raise a few eyebrows and yet again, we can’t wait to get going on this! Back to Gamebook Adventures, the art and text is almost complete for our sequel to GA3: Slaves of Rema titled, Sultans of Rema. Expect desert action in an arabian nights style with genies! We’re also underway on another four GA titles too, which should also see the light of day next year at some point! On the Fighting Fantasy front, you may have seen our follow-up gamebooks were name-dropped by Ian Livingstone in an interview with Pocket Gamer: Forest of Doom and Appointment with F.E.A.R! We’ll be developing them early next year! Phew…deep breaths…heads-down. There’s work to do! I’m really hoping the mystery 80s series in question is GrailQuest. That series has been OOP way too long, and I miss the Poetic Fiend. I used the contact form on your homepage but didn’t get any response, therefore I’m giving this a shot, although it’s semi-off topic. It’s related to your game book apps. Well that’s no fair! I’ll get Ben, our Technical Tin Man, to get back to you. Those contact forms come directly to me, so my apologies if your got lost. If it was in the last few days then it is still probably waiting for me to get to as I have been a bit inundated recently. In any case, GA1 should be compatible all the way back to 2.0 for devices that have the right hardware. If you can email me directly: benbritten at tinmangames dot com dot au then I can sort you out.